Here is an interesting coloured drawing from a French Freemasonic manuscript in the Bibliotheque Nationale, created in 1812-13 by François-Nicolas Noël. It is profusely illustrated with coloured drawings. The manuscript has two separate works 'La Physique du Macon' 1812 (pages 1-54) and 'L'Alchymie du Macon' 1813 (pages 55- ). 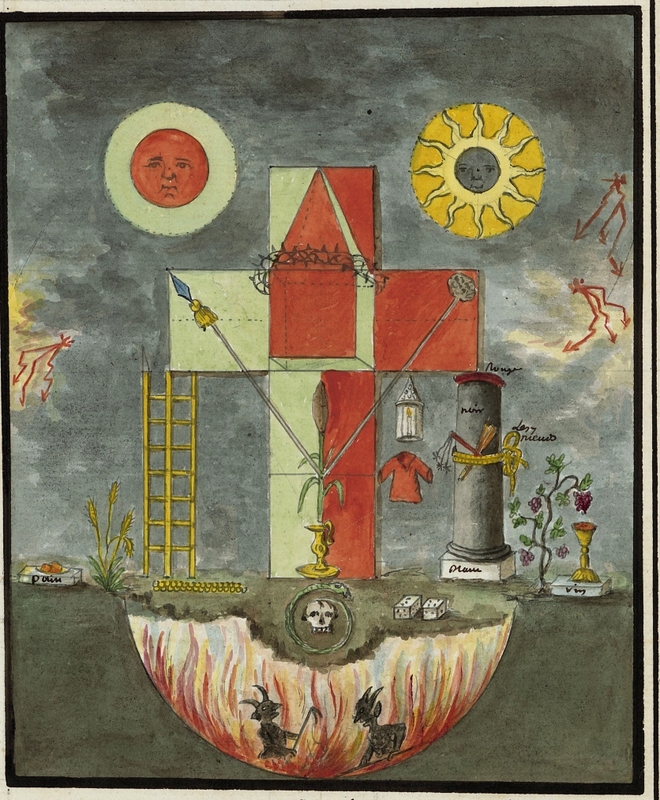 A number of the illustrations obviously draw from the late 18th century Geheime figuren (Secret symbols of the Rosicrucians) Altona (1785-88). It is primarily a synthesising and recontextualisation of alchemical and Rosicrucian imagery within a Freemasonic framework. 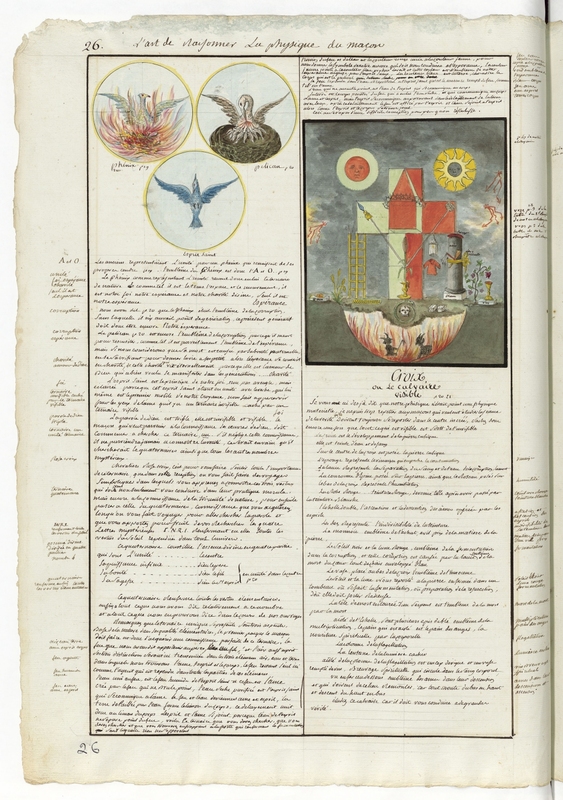 The related text below the image comments upon its symbolism. Know that our physics is not a physical material physics. I cannot repeat too often to the masons who want to study the science of truth, that they must always refer to the in-born centre, so then be sure that all that is visible is out of the invisible. The cross is the development of the cubic stone. It is tinctured with water and blood. On the centre of the cross is the cubic stone. The sponge represents the vinegar that prevents consumption. The spear represents the separation of blood and water, corruption, death. The crown of thorn placed on the stone, the ancient reed placed on the base of the cross represents the humiliation. The red dress [represents] the red dye, which has become so after passing through the white dye [stage]. The double ladder, [represents] ascent and descent, that some souls must learn from the spirit. The dice represent the indivisability of the tincture. The coins are emblematic of the low purchase price of the material of the stone. The black sun and the red moon, are symbols of fermentation into corruption, and that corruption is caused by the spear, emblematic of the death of the heart by losing all its enveloping water. The vase placed below the cross is an emblem of innocence. The sun and the moon refer to the stone enclosed in a tomb where fermentation takes place, or the preparation of the resurrection, when it emerges radiant. The death's head surrounded by a snake is the emblem of death by death. At the base of the ladder are several ears of wheat, emblematic of the multiplication. The bread which is extracted is the bread of the angels, the spiritual food for the body. The column is the flagellation. The lantern [symbolises] the hidden light. At the base of the flogging column is a vine of red grapes, and a vase of the divine temple, [holding] a spiritual drink circulating in the body's blood. The underworld below is emblematic of the souls in their descent and which must rise back up. Everything goes up from bottom to top and descends from top to bottom. Study this Calvary as it will lead you to a grander truth.